One of the most valuable principles out of twelve principles of green chemistry is the use of catalysis. The use of serious principles including reducing the utilization or production of hazardous material in chemistry reactions is green chemistry. This paper claims to review the catalytic importance of one of the most important organocatalysts called Ph3P. One of the most successful organocatalysts is phosphine that has been greatly utilized in isomerization of ynones or ynonates, Aza-Michael reactions, Baylis- Hillman reactions, allylic amination, and asymmetric [32] cycloadditions. These catalysts have become important for the synthesis of numerous cyclic and heterocyclic compounds. Keywords: Organocatalyst, synthesis, triphenylphosphine, catalysis, organophosphorus, green chemistry. Keywords:Organocatalyst, synthesis, triphenylphosphine, catalysis, organophosphorus, green chemistry. Abstract:One of the most valuable principles out of twelve principles of green chemistry is the use of catalysis. The use of serious principles including reducing the utilization or production of hazardous material in chemistry reactions is green chemistry. This paper claims to review the catalytic importance of one of the most important organocatalysts called Ph3P. 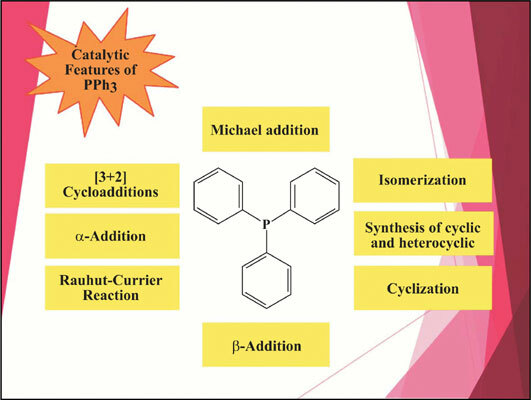 One of the most successful organocatalysts is phosphine that has been greatly utilized in isomerization of ynones or ynonates, Aza-Michael reactions, Baylis- Hillman reactions, allylic amination, and asymmetric [32] cycloadditions. These catalysts have become important for the synthesis of numerous cyclic and heterocyclic compounds.